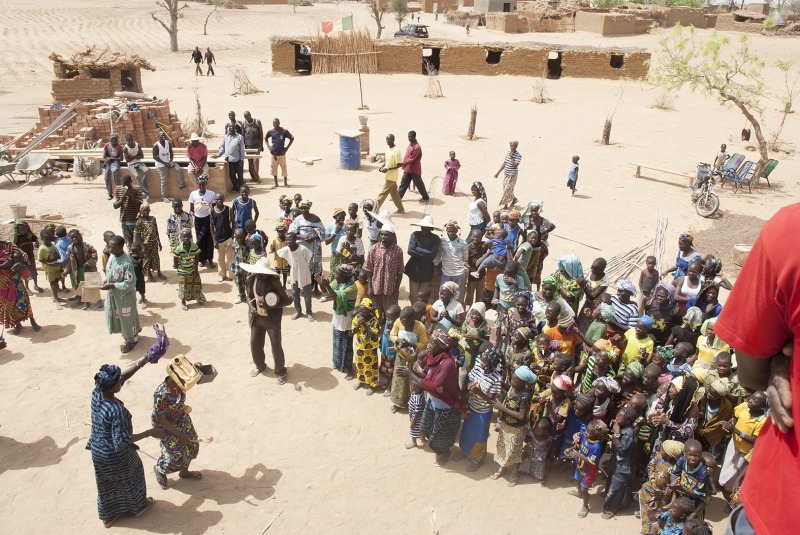 The village of Tanouan Ibi is situated on the plain, one hour driving from the mother-village Koundou in Dogon country, next to the rockface of Bandiagara in Mali (World Cultural Heritage of Humanity, Unesco 1986). The ensemble is composed of two buildings, each one counting three school classes. 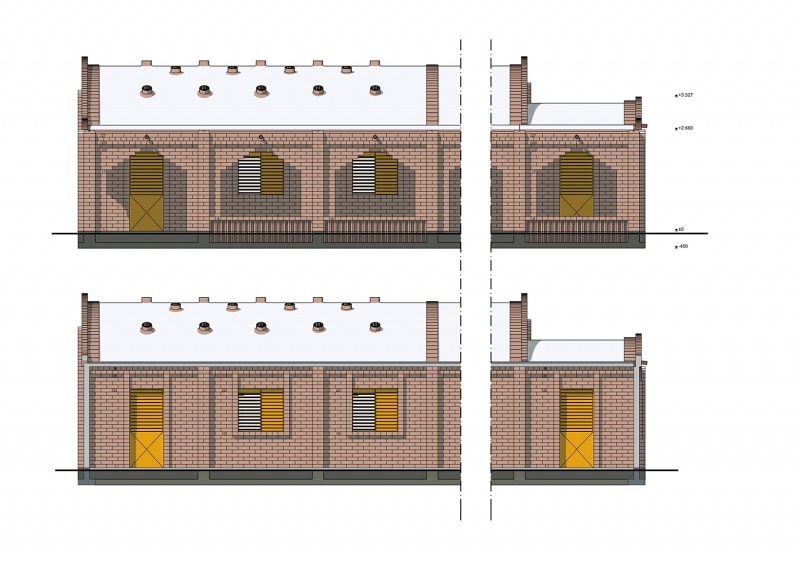 The first block of three classes with two verandas and a curved roof, provides also space for an office and storage facilities for the director. Next to this the installation of the sanitary block will be arranged. The enclosure and the planting of trees will follow afterwards. The school should comply with the demands imposed by the government and by the CAP (Centre d'Animation Pédagogique). A classroom should have a surface of 7 x 9 m² and should offer space to about 60 students. In total the school delivers space to minimally 180 students (3 classrooms) and an office with storage facilities for the director. The school should comply with the demands imposed by the government and by the CAP (Centre d'Animation Pédagogique). A classroom should have a surface of 7 x 9 m² and should offer space to about 60 students. In total the school delivers space to minimally 180 students and an office with storage facilities for the director, together making up an ensemble. The architecture of the school building is a search for a connection with the local traditions of building, of culture and of architecture. Finally this search also implies seeking an expression joining itself to an architecture applying partitions of surfaces, openings and closures, window and door frames and decorative forms. 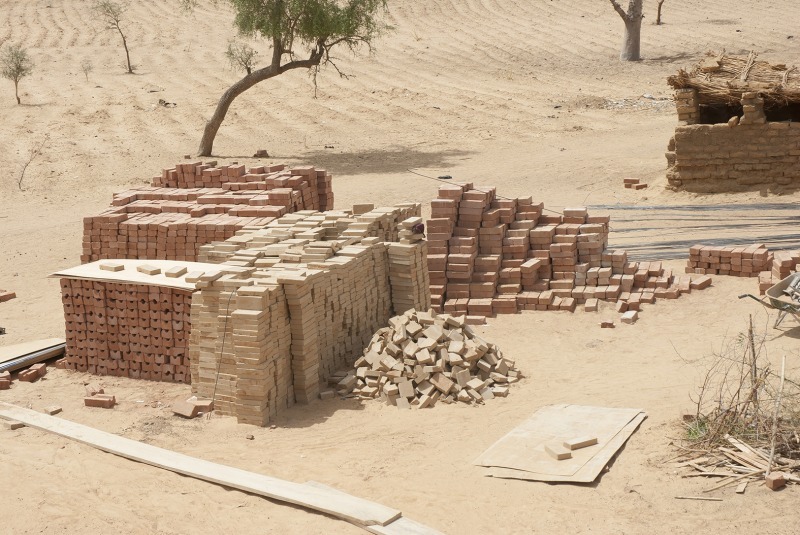 The use of stones of compressed earth, leads to a supple integration into the environment, corresponding to the way almost all Dogon villages fit into the landscape. The language of forms is a clear consequence of functional requirements. The structure of the school building is unique with two verandas running parallel to the class rooms. 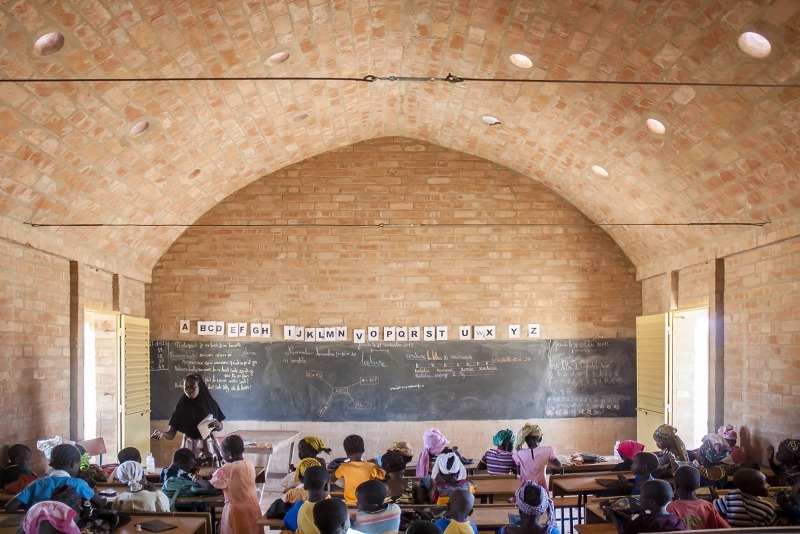 The two verandas operate like buttresses to be able to capture the weight of the barrel vaults in the roofs over the classrooms. 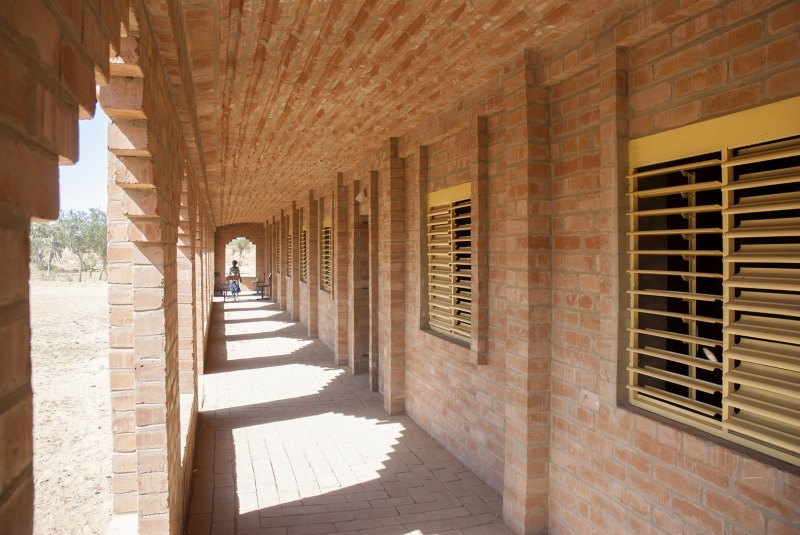 Next to this, the verandas, equipped with small stone benches, offer pleasant exterior room to the students. The verandas have been built in strokes of stones of compressed earth, piled up in an alternating way, and so determining the rhythm of the facades. At the entries and the exits, the stones follow the tension lines of the arcs, which lead to characteristic openings. 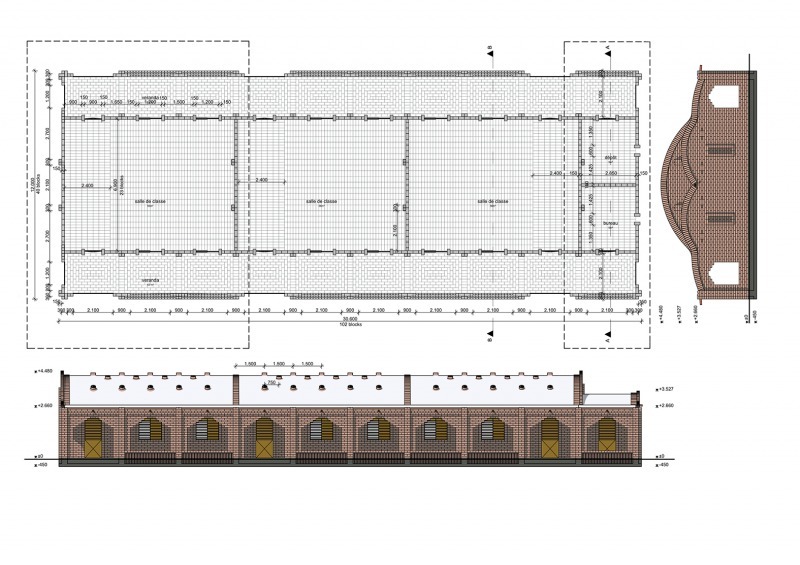 The roof and the eaves have been accentuated by an additional layer of stones and by dilatation stones, separating the barrel vaults. 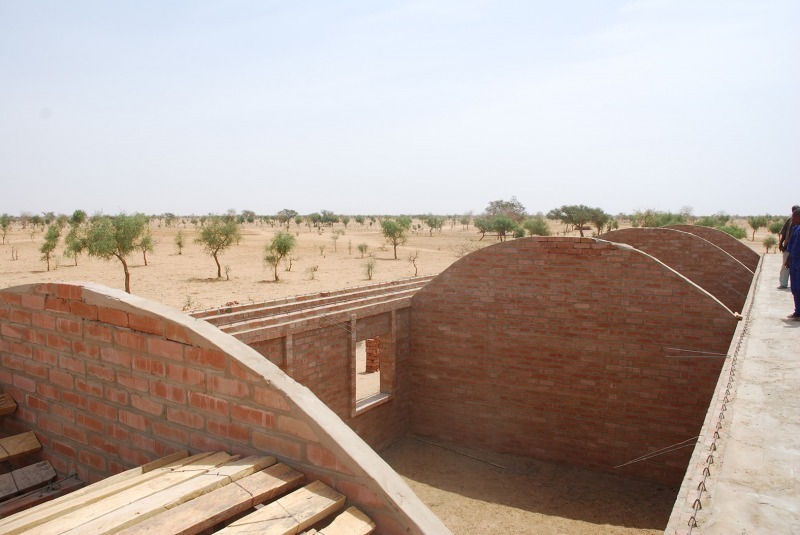 The roof, composed of stones of compressed earth, has been covered by a thick layer of 20-30 mm of red earth, mixed with cement in order to achieve a water proof and water resistant layer. The gargoyles, manufactured by the Bozo, guarantee the swift drainage of rainwater. In the roof, custom made ceramic tubes have been inserted, providing ventilation for a pleasant inside climate and allowing for the passing of daylight, like a starry sky. During the rainy season (2 months), taking place out of the school period, these tubes might be closed. The openings in the facades, with its window frames and with blinds, painted in a fresh and yellow color. The floor stones have been laid down in a decorative pattern, also to make clear that there are many varieties on this point. 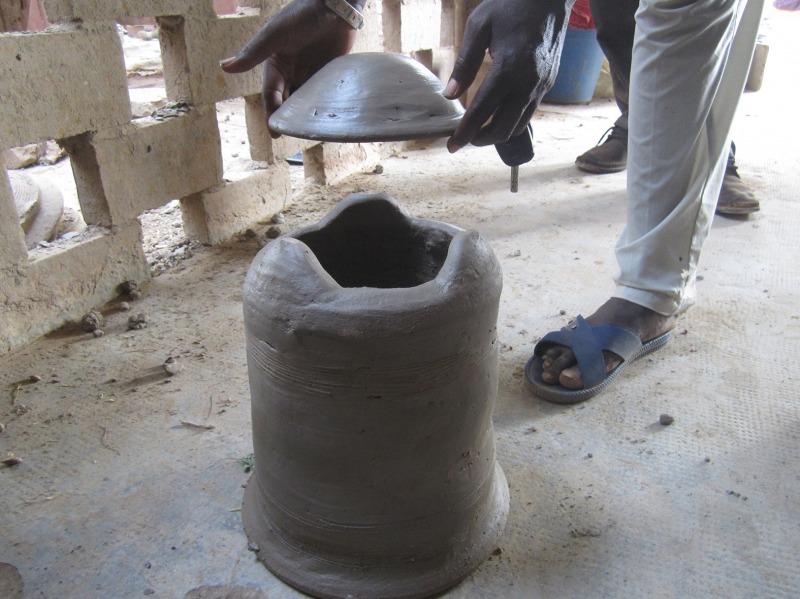 It is very important and as far as possible, to build with locally available materials. Economically and financially this is more interesting than importing materials. It is a more sustainable solution and more over the material is easy to deal with. The whole building, which means the bearing walls, the curved roof and the floors are made of hydraulically compressed earth stones. The stone compressing machine is mobile, which implies that the stones might be produced on the construction site itself, and the bricks might be laid on the same spot with a mortar in which also earth has been mixed. 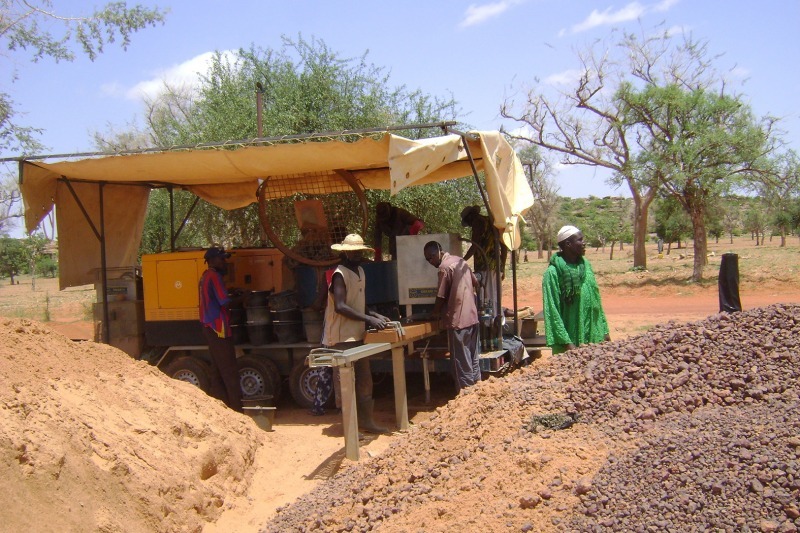 Each stone weighs 8,5 kg and could support a pressure of 15 N-mm². In order to make the stones water resistant, 3-4 % cement is added. The foundations are made in poured concrete. Since the use of local materials is an important point of departure, no separate supporting structures are used. 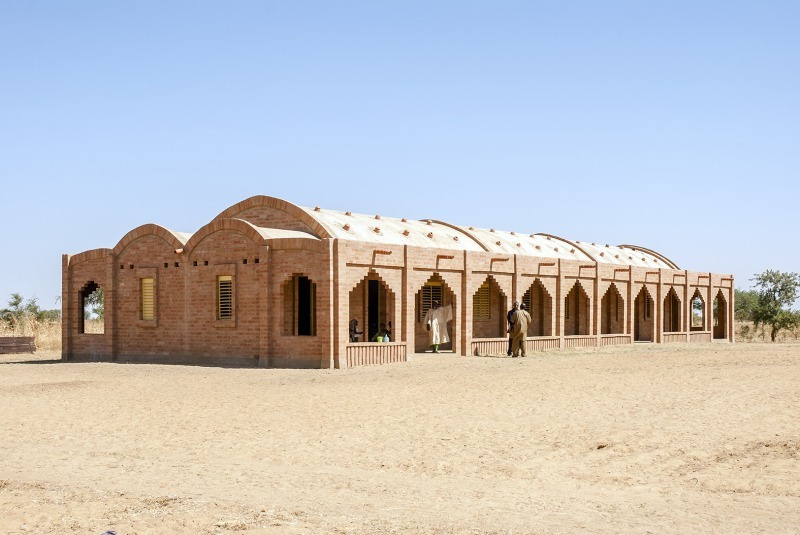 This way not only a unique clay building is created, but this leads also to design solutions enhancing its quality, like the verandas on both sides of the building. Moreover, the use of clay in the walls, the roof and floors, assures a very pleasant climate in the interior. 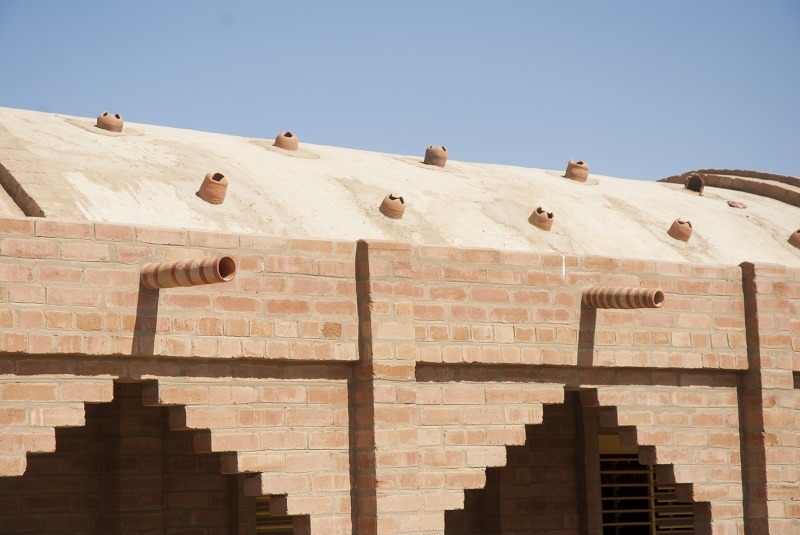 The unique ventilation tubes in the roof, inspired by traditional gargoyles, guarantee perfect ventilation and make a construction with a double roof redundant. One of the most important starting points was the use of local sources and materials. The objective here is to realize this way an affordable but sustainable building, fitting well into the landscape and being linked to local and traditional construction methods. For the reason of temperatures easily mounting up to 40 degrees Celsius or more, it is of paramount importance to realize a pleasant climate in the interior. This criterion asks for solutions based on an intelligent design and on the appropriate choice of materials. 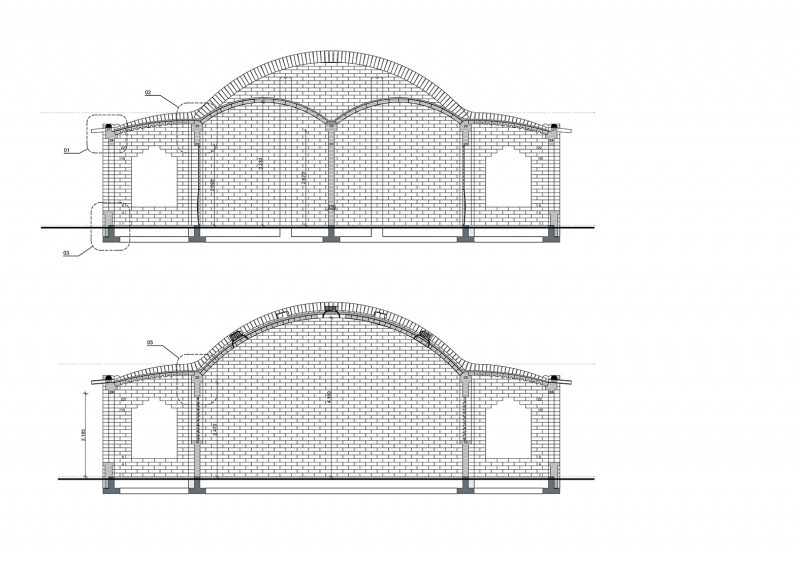 The roof, constructed of stones of compressed earth, verandas on both sides of the building and ventilation tubes will provide for a pleasant climate in the interior.